Today I have published not one, not two, but three new patterns! If you follow me on any social media, you may know the story of my fa-ther-in-law and the Norwegian sweater with reindeers he had asked for for Christmas. If you don’t – I made him the sweater, mixing two patterns. But he had lost much more weight than I had realized and instead of the two sizes too big he liked his sweaters to be, it came out about four sizes too big. So I remade the entire sweater and finished just in time for his birthday in March. Only after finishing did I realize that I had forgotten to add the reindeers from the second pattern this time. The photo we took of him trying on the sweater is one of the last – maybe the last – that exists of him. Two months later he died all of a sudden. What you may not know is that my father also loved reindeers. His collection of stuffed reindeer toys is living with me now and has been combined with my own small collection. They also both loved travelling. My father owned a Ford Transit bus (I used to call it the “duck car” as a child because there were huge duck stickers on the side) and travelled all the way down to Africa with it. The other thing they have in common is of course my love for them, and the way I miss them since they went to heaven. 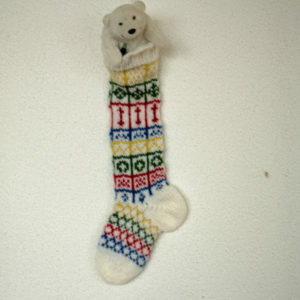 So for this stocking I used a heart pattern for love, a reindeer and a path for them to travel on. 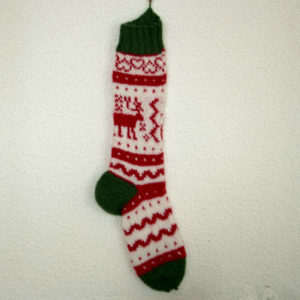 This Christmas stocking has been designed for my husband. 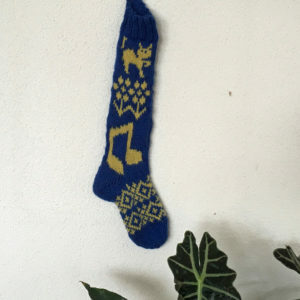 He loves cats, making music and his garden, so I chose the patterns for his sock with this in mind. You can mix and match the patterns as you like and even combine them with the patterns from my other two Christmas stockings if you got the whole set. This sock is dedicated to 7 year old me and to everyone out there who is being held back and told “you can’t do that, don’t even try!” by anyone. It is absolutely not dedicated to my elementary school handcrafts teacher. What stuck to me most was when she showed us how to do a braid with salt dough and when I wanted to do it, she said I shouldn’t even try and just use 2 strands and wrap them around each other. I was so sad and didn’t see any difficulty in what she had shown us. So, dear Mrs M, wherever you may be now, despite all your efforts I’m not only totally capable of making a braid – this sock uses one made from 5 strands! – I also turned out to be a knitting designer. I bet you didn’t see that coming! With the coupon codes HansPapa, Martin and YesSheCan the patterns are free for the first 10 users, 75 % off for the next 10, 50 % off for another 10 and then 25 % off for everybody until September 20th, end of day. Arabianknits, Mary E Rose, Denise Balvanz and I are each having an Instagram giveaway today! Follow all four of us on Instagram (@arabianknits, @maryerosedesigns, @denisebalvanzdesigns and @knitted_in_switzerland) and tag a friend in the comments with whom you’d like to win a pattern! We hope you’ll also join us for the Stress Free Christmas KAL starting on October 1st with many more awesome prizes to win and fun to be had! The chatter has already begun here. The three published patterns today bring my total count of patterns up to 60! As you can see from this long blogpost, there is already a lot going on today, but I’ll celebrate that milestone in style in a few days!